A customised electric actuator solution was designed that met the committee’s specifications: as a result, AUMA is the sole supplier of electric actuators for double block and bleed (DBB) valves in India. The company’s devices are installed in over 160 oil terminals across India. A major fire incident at a Jaipur oil terminal in October 2009 triggered an extensive review. It was established that a defective hammer blind valve had caused the explosion. The resulting recommendation was to use closed systems with pressure balancing plug or ball valves. A decision was taken by major Indian oil companies to replace hammer blind valves with double block and bleed valves, combined with electric actuators that support communication via the robust Modbus protocol. AUMA took a proactive approach to respond to the requirements. The established manufacturer of modular electric actuators, which invests heavily in R&D and provision of tailored actuation technology, worked closely with an Indian DBB valve manufacturer to ascertain the precise requirements of the recommendation. 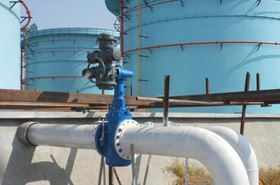 A significant oil sector base for AUMA includes supply and commissioning of over 3,000 explosion proof actuators using latest fieldbus technology to support automation of a large range of valve types in major Indian tank farms. German pump manufacturer, HALM, has announced that French and Swiss customers will have access to local customer service.